Ponte Salaro taken from Views of Rome and its Vicinity published by Merigot and Edward, 1796-98. Shown here is an additional view. An earthenware skimming bowl printed with the Tower pattern. 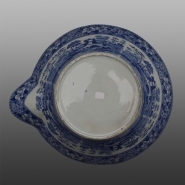 This bowl was used in the production of milk and would allow the user to separate the milk from the cream which floated to the top. The pattern was adopted from an original source print shown below.